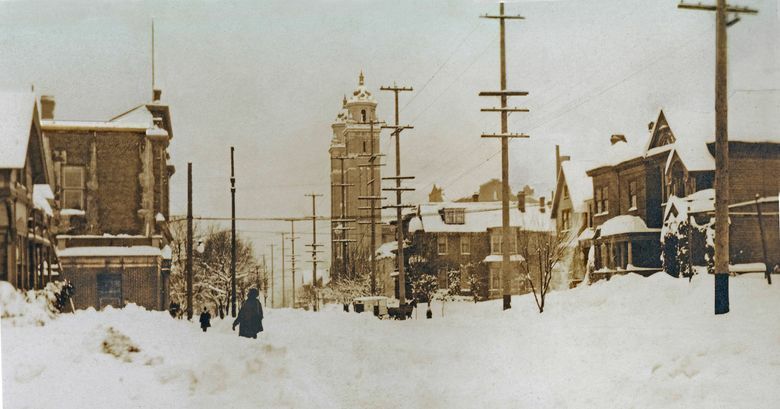 THIS WINTER WEEK, we share another photo from The Big Snow of February 1916. Except for Puget Sound’s prolonged pioneer blizzard in 1880, the 1916 snow was the deepest in our city’s history. For any media, including the thousands of box Kodaks in the hands of Seattle citizens, the four-day blizzard was a sensational, although slippery, subject. Like motorcars at the curb, cameras by then were nearly commonplace. 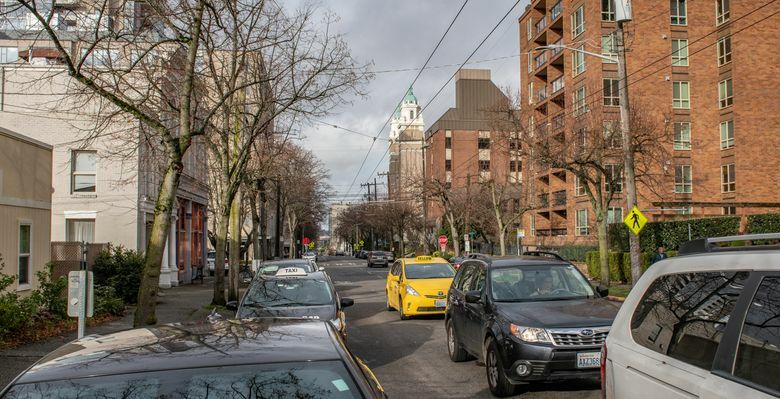 The absence of cars here on First Hill’s Ninth Avenue is best understood as related to the drifts, and the lack of snowplowing in these blocks by the understandably unprepared municipal streets department. A team of horses pulling a covered wagon can be found at the scene’s center, heading east on Columbia Street from its intersection with Ninth Avenue. For snow like this, teams were favored. An unaccredited photographer looks north on Ninth Avenue with her or his back to James Street. This First Hill prospect might have been reached from Pioneer Square aboard a James Street cable car — assuming that the Puget Sound Traction, Light & Power Co. cable cars were then still plowing through the drifts. Or the photographer might have lived nearby: First Hill was Seattle’s first neighborhood of accumulated wealth, which often would have included cameras in the libraries. 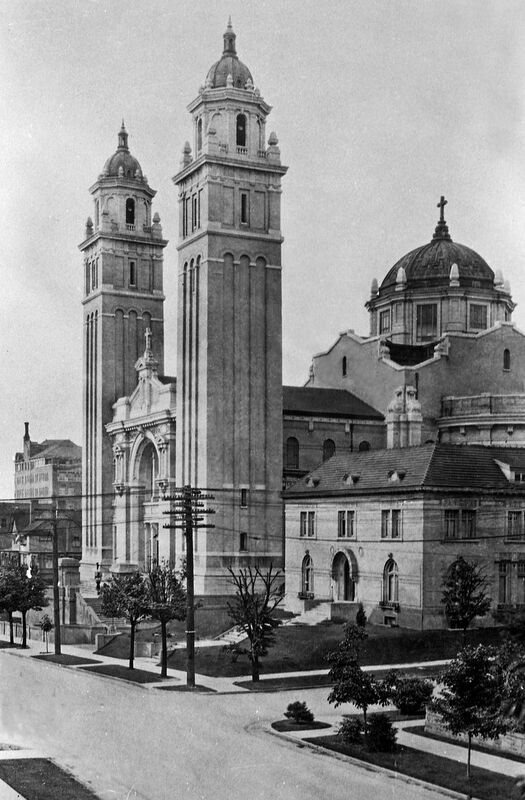 Since 1907, the grandest interruption of Seattle’s skyline has been the Roman Catholic St. James Cathedral at Marion Street and Ninth Avenue. Before Feb. 3, 1916, St. James had three landmark elevations: two Renaissance towers and the cathedral’s centered dome. On Feb. 2 of that year, it lost the dome. The architects who examined the crashed dome on the chancel floor concluded that the sanctuary’s roof was five times stronger than needed to hold even the heavy, wet snow left by the blizzard. The engineering culprit was a weakness in one of the dome’s steel supports. For comparison, we also have included a print of the dome before its collapse and crash, so the damaged roof can be compared with the intact one. Although splendid in its soaring outline, the intact roof was, we learn from Maria Laughlin, the current director of stewardship and development for the cathedral, a handicap to the cathedral’s acoustics. What the crash took from the church’s eye it gave back — miraculously? — to its ear. Since the crash of its sound-swallowing dome, St. James has become a space for concerts, and much kinder to its organ and choir.